This Easy Finance Swooper Flag Sets Up In Minutes! These Signs are Highly Visible! 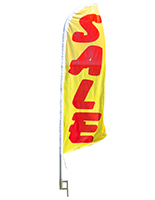 This Easy Finance Swooper Flag is Durable for Outdoor Use. Pre-printed single side (dyed through) with reverse image on back for highly visible signage. 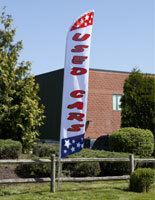 14' Height banner with red, white, and blue color scheme for an eye catching display. 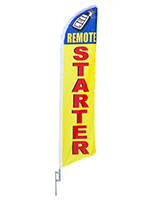 This easy finance swooper flag that comes with a durable ground spike is designed for outdoor use. 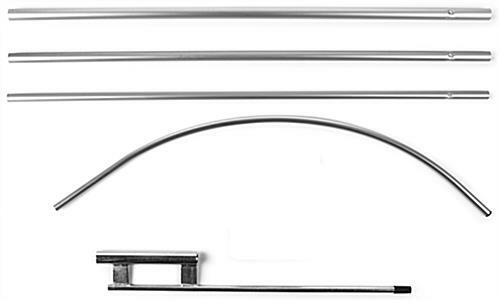 This display is designed with a stay open feature so the banner is always visible with or without wind. 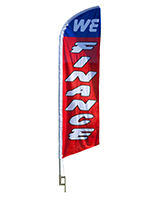 This easy finance swooper flag that is a promotional tool is economical for small businesses seeking more exposure. In a competitive market, this banner is sure to help set businesses apart. 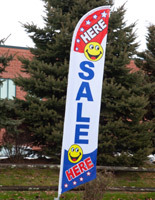 This feather banner, easy finance swooper flag that is portable can be reused in different locations. This car dealership banner can be strategically positioned by the road to grab attention of passerby customers. 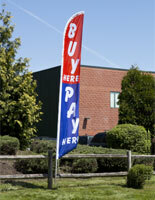 This easy finance swooper flag is pre-printed on a poly knit material for bright colors and durable outdoor use. This sign display is ideal for auto sales establishments and essentially increase traffic and sales. 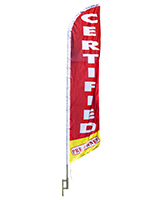 This easy finance swooper flag includes a 4 piece aluminum pole which is a fraction of the cost of fiberglass poles. This message pennant includes a metal ground spike that can be reused. 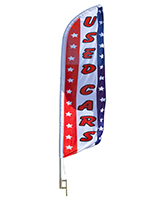 This attention grabbing easy finance swooper flag, also known as car dealer advertising, is an economical method of promoting deals. This auto dealership advertising kit includes everything needed to install upon receipt. 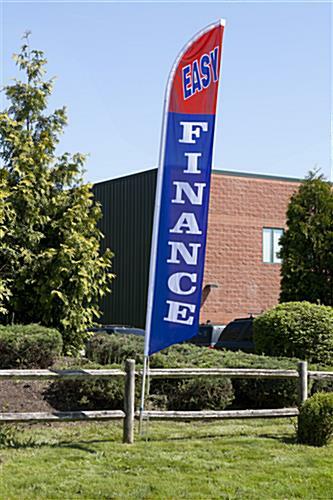 This blue and red easy finance swooper flag is brightly colored to grab attention. New businesses can use this display to inform potential customers of services offered. This easy finance swooper flag is a colorful eye catcher.